Work, family and studies are the most important reasons for coming to Finland. Migration brings to Finland international talents who can be harnessed both to create new jobs and to spur entrepreneurship and innovations. They can also promote business growth and internationalisation. Click here to sign-up for the event Talent Boost Summit landing page. 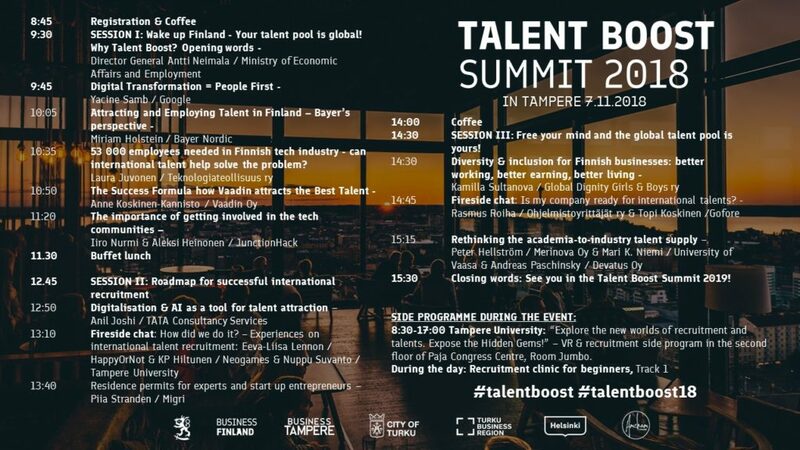 Talent Boost Summit 2018 in Tampere will be focusing on talent attraction, and on the numerous ways that companies can succeed through it. We welcome HR specialists and personnel responsible for recruitment, as well as other company representatives, company executives, entrepreneurs, public sector representatives, decision makers, university representatives, public service providers and international talents. The Summit is free of charge and in English. The event will be streamed online, and photographs will be taken. The event will be organised in cooperation with the Ministry of Economic Affairs and Employment, Business Finland, Business Tampere, City of Turku & Turku Business Region, City of Helsinki and Amcham. Click here to learn more about the Talent Boost agenda from the official program website. For more information on the Talent Boost agenda and on the Talent Boost Summit in Tampere, please contact us at Talent Tampere. The Talent Boost Summit is meant to be an annual gathering which would move between the major talent boost cities of Finland. The first Summit was held in Koskenranta, Helsinki in 2017. In 2018 the event will be held in Tampere, and again elsewhere in 2019. In order to improve awareness of the Boost agenda and programme among private sector actors, the Ministry of Economic Affairs and Employment and its partner organisations are hosting talent attraction and retention related events in the related cities in Finland. Talent Boost Summit was the first event ever of this scale in the domain of international talent attraction management in Finland. And therefore also the most concrete example of national level cooperation. The objective of the Government’s joint Talent Boost programme is to make Finland more attractive to international talents and to channel the expertise of international talents already in Finland to support growth, internationalisation and innovation in Finnish companies. -Ministry of Economic Affairs and Employment, 2016. Over 300 people gathered for the Talent Boost Summit 2017. The Summit was held in Helsinki, partly as a culmination of three earlier thematic workshops led by the Ministry of Economic Affairs and Employment of Finland, and at the same time, as a path-opener for the recently established Finnish governmental programme Talent Boost – International talents boosting growth. Among the participants were representatives from cities, companies, higher education institutions, ministries, as well as international talents. Several organisers affirmed that it was the first event at a national level to allow all the relevant stakeholders to come together at once. To read more about last years event click here to redirect to the Ministry’s webpage.